The 2019 spring session begins April 17 and summer session begins July 17. Both sessions run for 11 weeks each. Shotgun starts begin between 5:30 PM and 6:00 PM, depending on what daylight allows. The format is a nine hole 2-woman best ball with prizes awarded both weekly and at the end of the year. New this year there will also be a social scramble flight with an easier format. Ladies are split into different flights based on handicap. 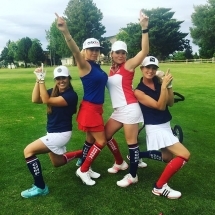 Players will find certain flights to be competitive for experienced golfers and others to be fun and educational for those with higher handicaps. Many golfers in the bottom flight play with the max handicap, and those that haven’t had a handicap before can play and not feel intimidated. 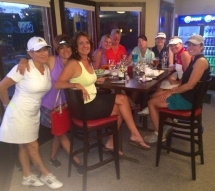 Socialize after the round with great food and drink specials in the clubhouse. Cost for the spring session is $210 for 11 weeks of league including the green fees, prize fund and administrative fees. Carts are additional and can be paid the day of. Annual pass holders and smart pass holders receive discounted rates. Membership in EHLGA and establishing your GHIN handicap for 2019 is also required. This is an additional $65 for the year and can be done through the league registration form as well. This is a yearly fee, so if you play in summer league it would not need to be paid again. 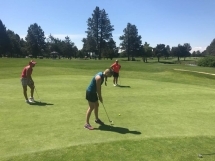 Establishing your handicap also allows you to play in various tournaments at Eagle Hills and other golf courses throughout all of 2019. For more information, contact Jean Cariaga at jeancariaga@hotmail.com. To register for league, please complete the form through the link below. To join the EHLGA for the 2019 season and either renew or establish your GHIN handicap, please click the button below and following the instructions on the pdf form. The cost for membership this year is $65. This will give you a valid GHIN handicap with the IGA and by joining the EHLGA give you eligibility to play in the twilight league, Thursday Play of the Day events and various tournaments throughout the year. 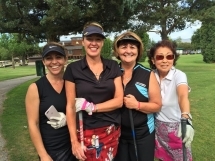 All EHLGA members are welcome to participate in ladies’ day on Thursdays for 18 holes of golf. Unlike Wednesday League, play is optional from week to week and you may play as much as or as little as wanted. Each week offers a “Play of the Day” with prizes awarded to several winners. All levels of play are welcome, even if you do not have a handicap, and no partner is needed. Players are only responsible for paying for green fees the days they would like to play. Sign up by calling the pro shop at 939-0402 by Tuesday before the Thursday would you like to play. For more information contact Vi Neslon at 530-604-0871. 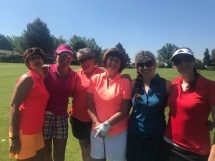 The Wednesday Twilight League and Thursday Play of the Day are both organized by the Eagle Hills Ladies’ Golf Association. Anyone is welcome to join! Whether you’re an experienced golfer looking for competitive play, a total beginner looking to improve or simply a social golfer looking to meet new players, we would love for you to join our association. 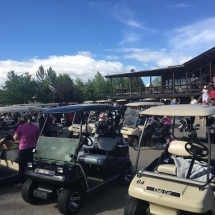 According to the Idaho Golf Association, Eagle Hills has one of the largest women’s membership of all public Idaho courses. Eligibility to play in the Wednesday Night Ladies’ Twilight League. Eligibility to play with the Thursday “Play of the Day” ladies. Eligibility to play in various optional tournaments throughout the year including our Eclectic Tournament, the 2-Lady Open Best Ball/Scramble and the Club Championship. See tournament schedule here. Invitation to the Spring Luncheon and social. Invitation to the Christmas Party. Travel team days to other courses. WIM golf days to other courses. Sponsorships allow the EHLGA to include additional prize funds for tournaments and also provides great exposure to local businesses! A $50 sponsorship includes a banner or sign displayed at the clubhouse and on a hole of the golf course during one golf tournament. A $100 sponsorship gets you the same for all FOUR tournaments this year!